28 AugFujitsu Split System Offer Ending Soon! As this offer ends on the 3rd September 2018, you’ll need to be quick to take advantage of Fujitsu’s Master Winter Warmth Promotion. Winter may be drawing to a close, but as it’s a split system, you’ll be ready for the summer too. Remember, if you purchase a Fujitsu Reverse Cycle Inverter Split System, Inverter Multi Split System or Ducted System from 9am AEST Monday 4th June to 5pm AEST Monday 3rd September 2018 and be honoured with a Pre-paid Visa card worth up to $400*. 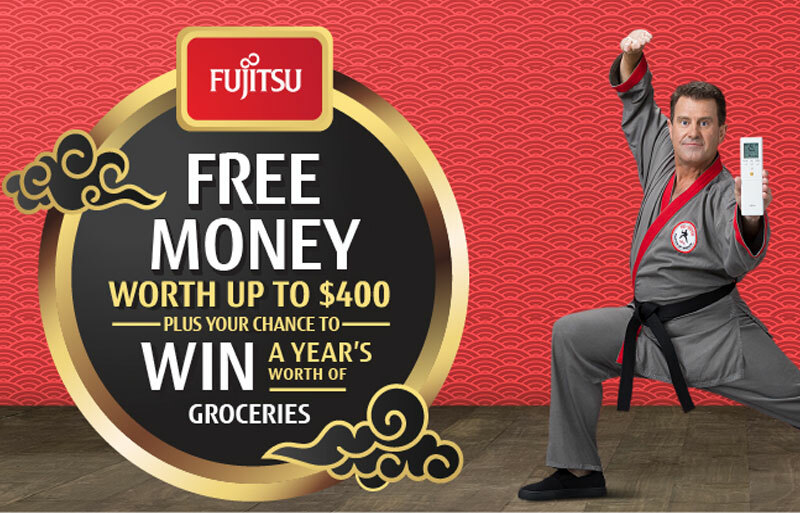 Each valid claim will automatically go into the draw to win a year’s worth of groceries valued at $13,000. There are 10 to be won. Call our showroom on 4222 9988 to organise a quote. *Please see our promotions page for terms and conditions.